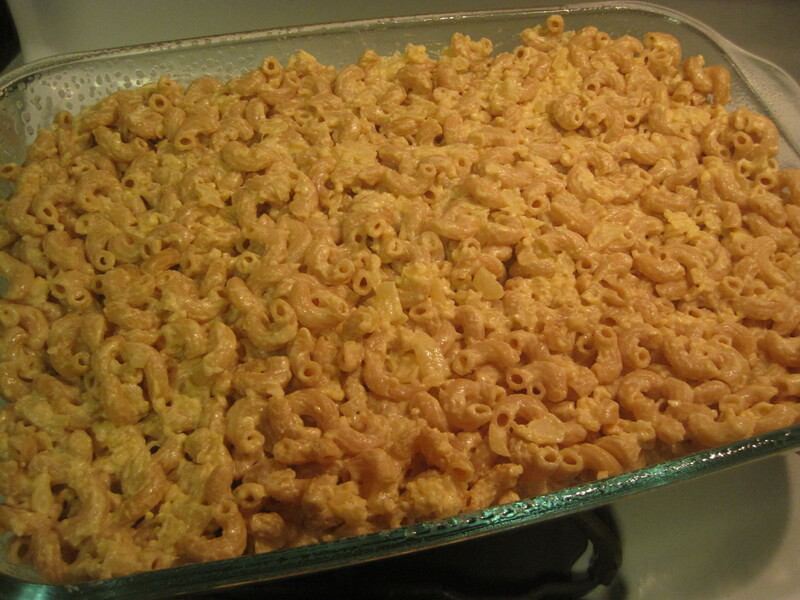 A good friend (and regular reader) recently challenged me to make a healthy version of mac ‘n cheese. Since this good friend was also my college roommate, I know how much she loves this delectable comfort food. I admit, it’s one of my guilty pleasures, too. 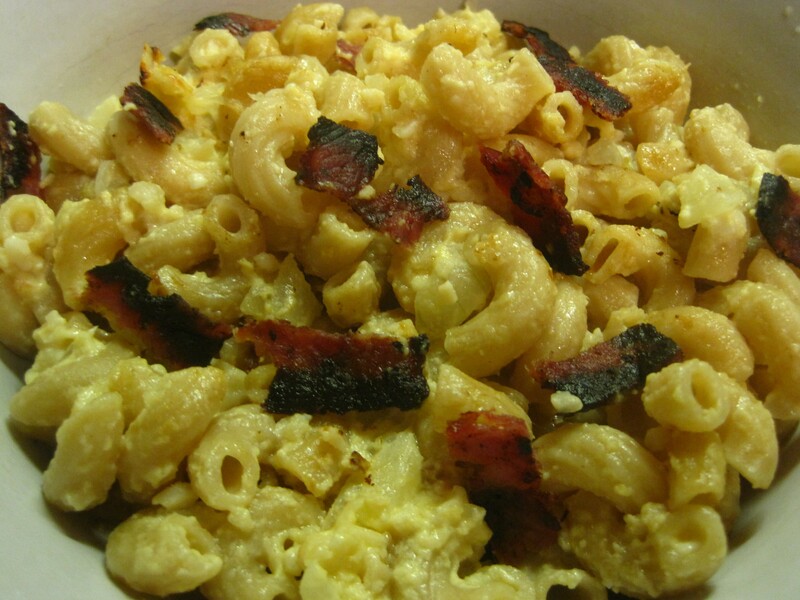 I love the rich, gooey, creaminess of mac ‘n cheese. 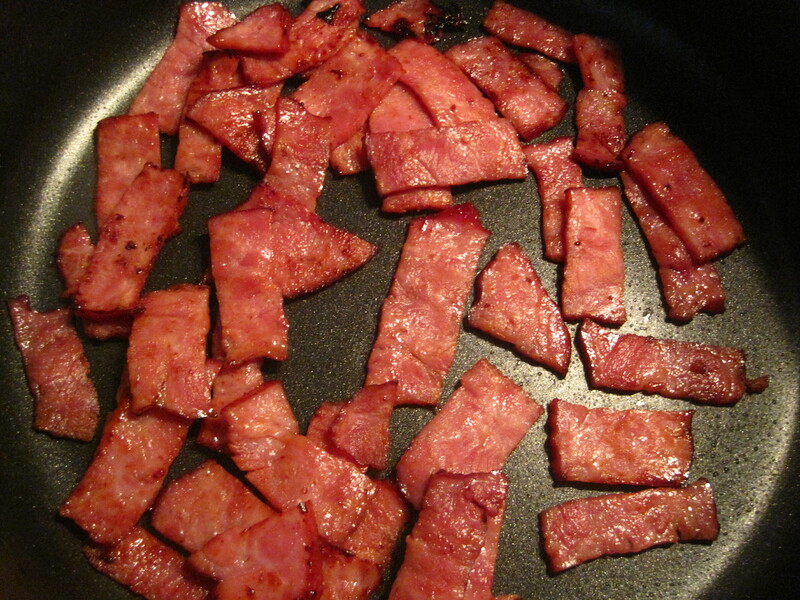 One of my favorite tricks is throwing in some smokey, crispy bacon (yum!). However, since neither of us have the metabolism of an 18-year-old anymore, we can’t eat mac ‘n cheese nearly as often as we’d like and still fit into our jeans. So, challenge accepted. Keep in mind, I don’t think there’s anything that can truly replace the fake, bright orange Kraft mac ‘n cheese with whole milk and real butter. But this dish gets pretty darn close. I swapped out the milk, butter, and cheese with low fat cheese and Greek yogurt. I love the Greek yogurt because it adds in that creaminess that you might be missing, plus it’s loaded with protein for added health benefits. 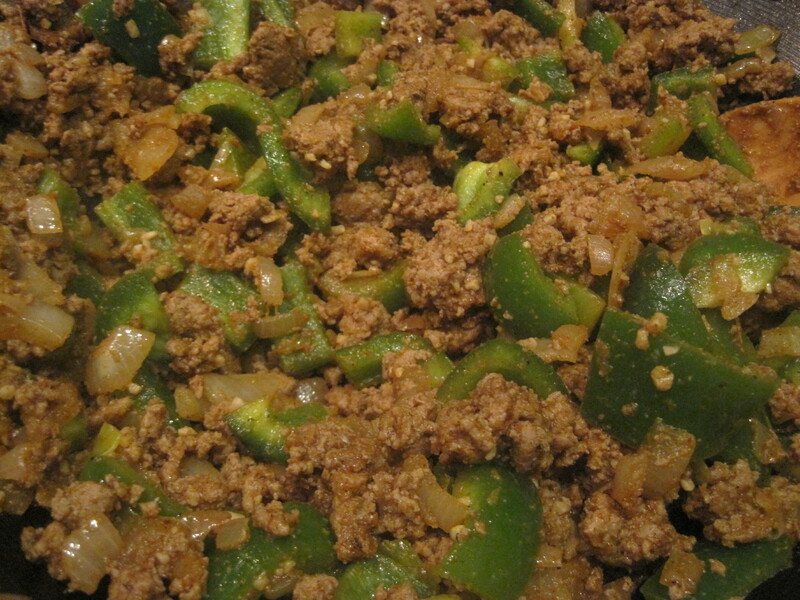 I also added in some onion and garlic to add taste and fill you up on virtually-no-calorie veggies. I also used turkey bacon instead of real bacon, and I used whole wheat pasta instead of white pasta. While it’s not the healthiest dish in the world, it’s certainly a great substitute for the much-less-waistline-friendly version. Plus, it only took about 20 minutes to make and it makes great leftovers! Make this dish the next time you have a comfort food craving. Preheat your oven to 425 degrees. Spray a 9×13 inch baking dish with cooking spray. Set aside. Bring a large pot of water to a boil. 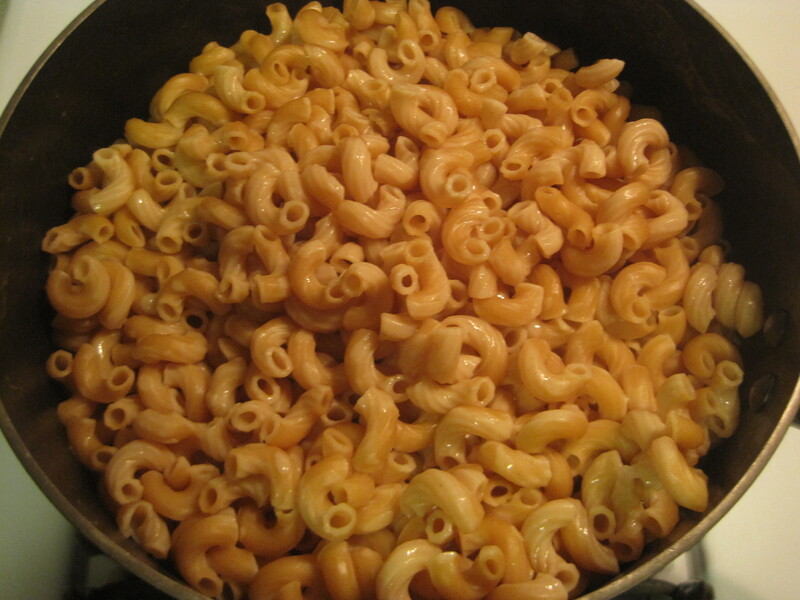 Add the macaroni and cook according to package directions. Drain when it’s done, and then add it back to the pot. Whole wheat pasta keeps you satisfied longer. While the pasta cooks, chop your onion as finely as you can. Set a medium-sized pot over medium heat and coat with the olive oil. Add your chopped onion, minced garlic, and dry mustard. Stir often and cook until the onion is transparent (this should take just a couple minutes). Chop those veggies very finely so they mix in with the cheese sauce. Honestly, you barely notice they’re in there. The onions and garlic are slightly sweet and add tons of flavor. 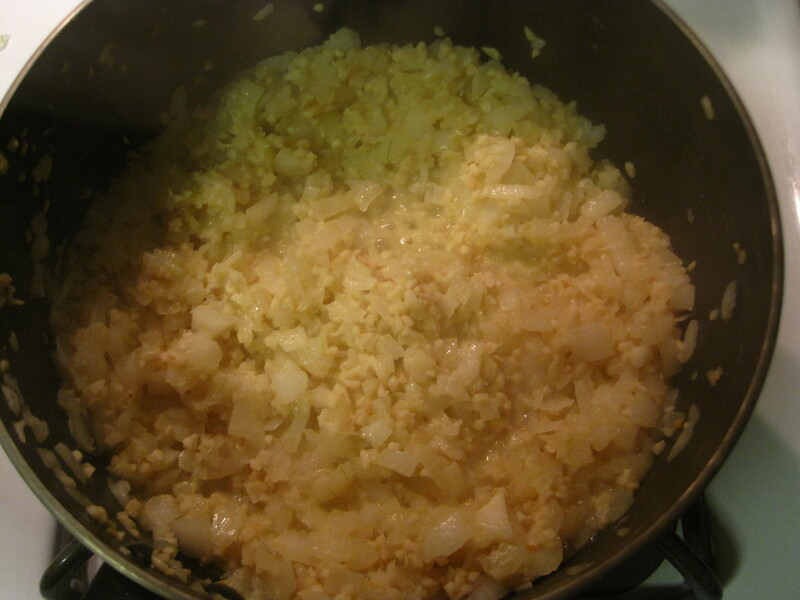 After the onion-garlic mixture is done, add the cheddar cheese and stir until melted. Turn off the heat, then add the Greek yogurt and stir. Creamy, gooey, and delicious. It’s not that same fake bright orange, but it’s very tasty! 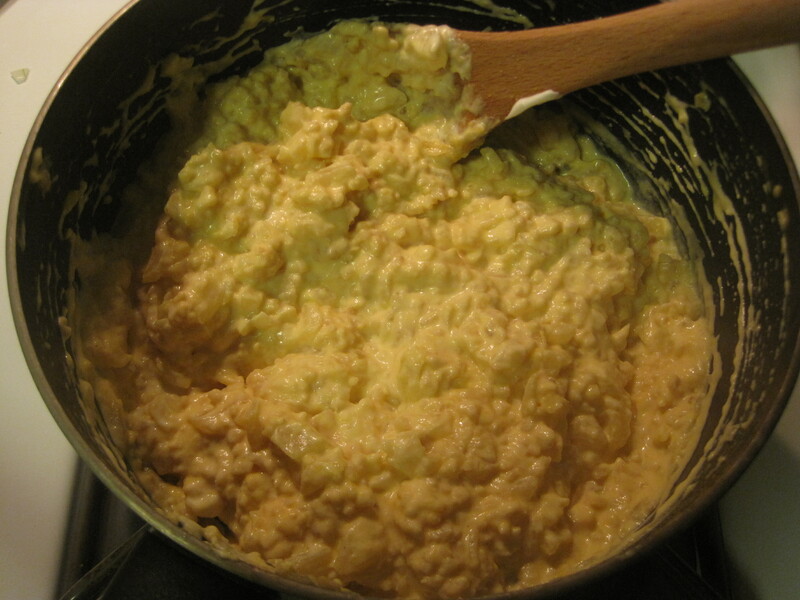 Add the cheese sauce to the cooked macaroni noodles and stir until combined. Add to the 9×13 inch baking dish, and then sprinkle the Parmesan cheese on top. Bake for about 10 minutes, or until the Parmesan is melted and the macaroni is hot throughout. While your mac ‘n cheese bakes, put a pan over medium-high heat on the stove to cook your turkey bacon. Spray the pan with cooking spray, and cook the turkey bacon for 5 minutes on each side. 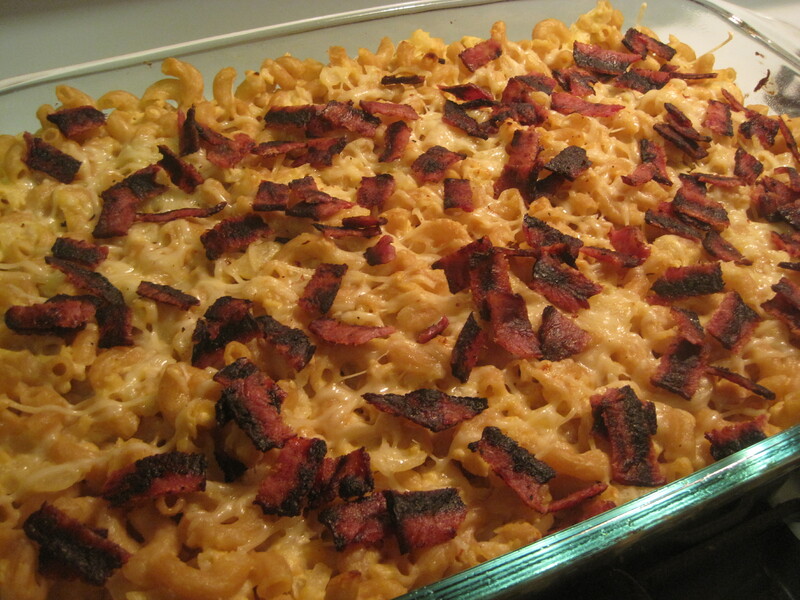 Your turkey bacon should be done at about the same time as the baked mac ‘n cheese. 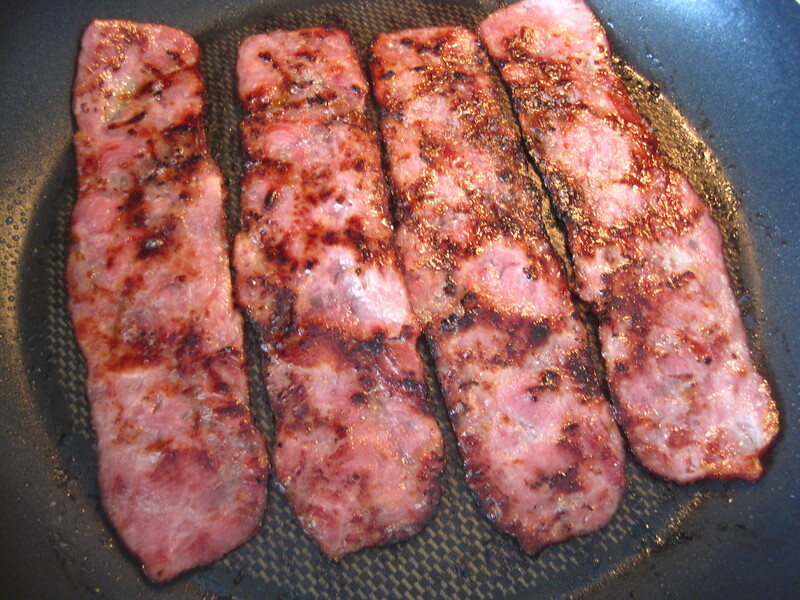 The reason I cook the turkey bacon separately and add it to the dish at the end is so that it stays crispy. Lastly, tear the turkey bacon into small pieces and sprinkle over the mac ‘n cheese. The bacon adds some smokey, crispy, saltiness that puts this dish over the edge. You’ll hardly notice it’s healthy! I like making Brussels sprouts often because they require very little effort, yet they’re extremely healthy. They’re low in Saturated Fat, and very low in Cholesterol. They are also a good source of Thiamin, Riboflavin, Iron, Magnesium, Phosphorus and Copper, and – let me catch my breath – a very good source of Dietary Fiber, Vitamin A, Vitamin C, Vitamin K, Vitamin B6, Folate, Potassium and Manganese. Wow. 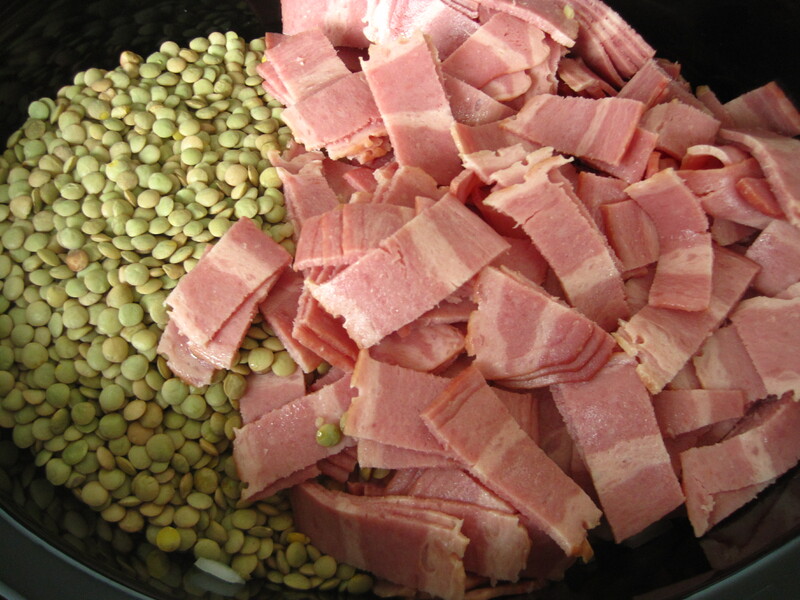 And if you don’t think you’re the hugest fan of the taste, throw in a little turkey bacon and you’ll barely notice. For all that awesomeness and basically no downside, sign me up. I came up with this dish when I had a few ingredients left in my fridge that I needed to use up because I was going on vacation. Because Brussels sprouts are so awesome, as you can see, it’s not uncommon for me to pick them up at the market to keep in my fridge if I don’t feel like a frozen steamable veggie. And although I didn’t include turkey bacon in my kitchen staples list, you’ll almost always find some in my fridge because it’s a great low-cal breakfast protein (you can see that I use it in many of my recipes). But both the Brussels sprouts and turkey bacon needed to be eaten before I went on a 10-day trip, and I was starting at the almost-empty fridge thinking, okay what do I do now? I didn’t have eggs or other veggies to make an omlette or frittata. And the thought of my Brussels Sprouts with a Kick didn’t sound awesome with a side of turkey bacon. So I thought, why not combine them? I still had my jar ‘o chopped garlic, and luckily I had some chicken broth in my pantry. 20 minutes later and my oddball dinner was done. Super healthy and totally delicious. **Tip: If you have it, a shallot would be awesome in this dish. Unfortunately, I didn’t have that in my extremely limited fridge when I made this. Chop the shallot and add it to the pan at the same time as the garlic. Put a medium pot over medium-high heat on your stove and spray with cooking spray. Use kitchen scissors to cut the turkey bacon horizontally into strips and put them in the pot. **Tip: Cutting turkey bacon with scissors is way easier than using a knife. I do this for regular bacon, too. You want to cut the bacon thinly enough that you get a little bit in every bite, but not so big that you can’t taste it with the Brussels sprouts. Continually stir the turkey bacon for about 6 to 8 minutes until it is cooked on all sides. 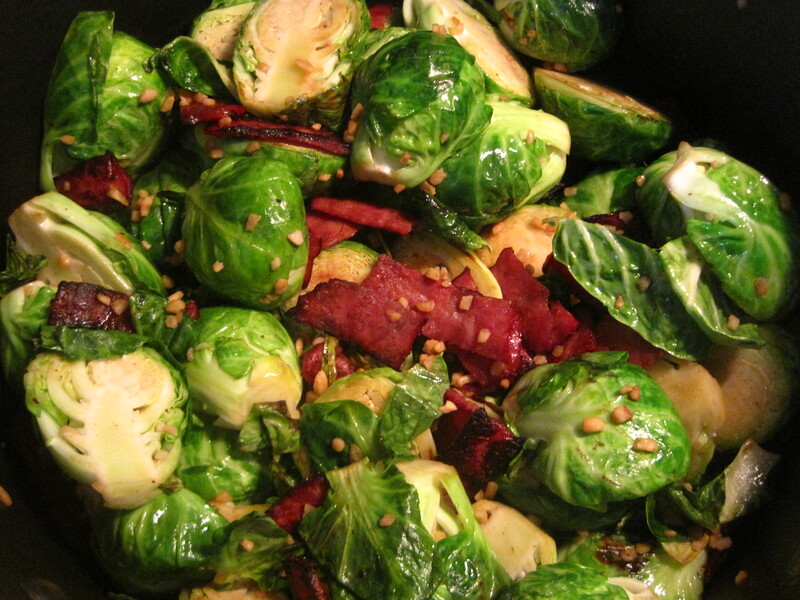 While your turkey bacon cooks, prep your Brussels sprouts. Cut off the stem and cut them in half (see my Brussels Sprouts with a Kick for a visual). Set aside. After your turkey bacon is done, turn the heat down to medium and add the olive oil and garlic. Cook for about 1 minute, and then add your Brussels sprouts. Cook the Brussels sprouts for about 2 to 3 minutes to soften, then add the chicken broth. Bring the broth to a boil, then cover and simmer for about 10 minutes over medium-low heat. Happy weekend! As you saw in my pancake post, weekends are my favorite for making killer breakfasts. 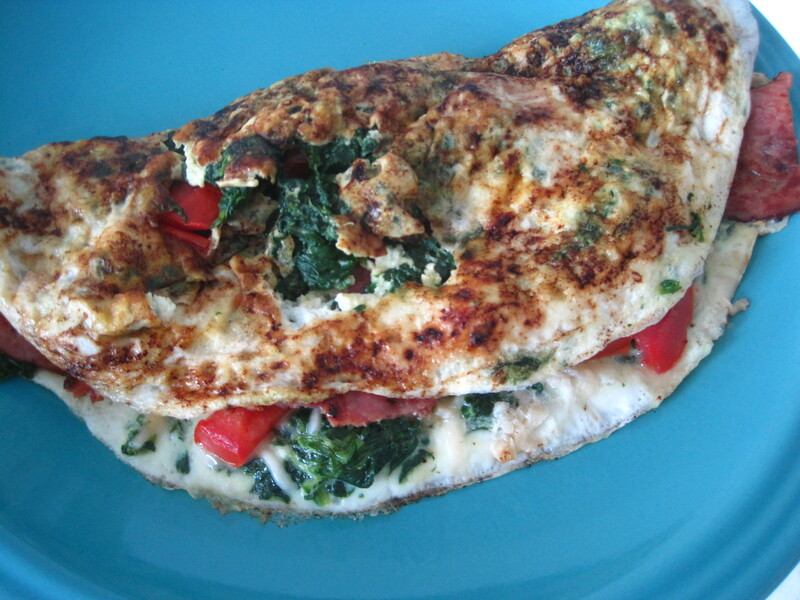 So if you’re in the mood for something more savory but still super healthy, this egg white omlette is for you. In under 20 minutes, you’ll have a hearty, protein-packed, garlicky, smokey, delicious breakfast. And most of the ingredients are already in your fridge. With all the flavor packed in this dish, you won’t miss the less healthy breakfasts at all. You’ll still get the creaminess with the bits of Parmesan, you’ll still get the texture of the eggs, and you’ll still get the smokiness and saltiness with the turkey bacon. Eat up and enjoy this guilt-free breakfast. **Tip: Use the steamable veggies you already have in your freezer, or toss in any veggies you need to use up in your fridge. The more you pack in, the more full and satiated you’ll feel after eating tons of “free” foods. Spinach is necessary, but all others are optional. Pop your frozen spinach in the microwave to defrost because it takes about 5 minutes to cook. Drain out any excess water after it’s done. Put a large pan over medium-high heat, and spray with cooking spray. Once it’s hot, put in your turkey bacon. You’ll want to brown it on both sides, so cook for a few minutes on one side and then flip and cook a few minutes on the other. After it’s done, remove from the pan and slice into thin strips. This is what your turkey bacon will look like. Just make sure it’s browned on both sides. While your turkey bacon cooks, prep your veggies. Chop any fresh veggies you have, or continue defrosting any frozen veggies after your spinach is done. It’s important that all veggies are ready to throw in before you even put eggs in the pan because they cook so quickly. After your turkey bacon is done and all your veggies are prepped, turn down the heat in your pan to medium heat – you’ll be using the same pan for the omlette that you cooked your turkey bacon in. Put half of your eggs in the pan (about 1/2 cup) so that it covers the entire bottom of the pan. Throw half of the spinach right on top of the eggs, spreading over the entire surface area. Then, sprinkle half the garlic and Parmesan over the entire pan. 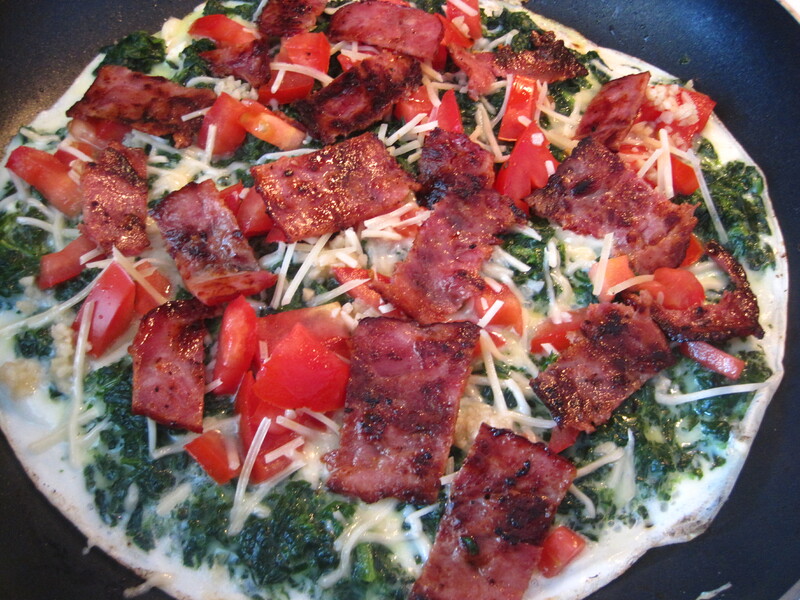 Add the rest of your veggies and turkey bacon (half, of course). Because the egg whites cook so quickly, there’s no crazy omlette flipping necessary (a skill I haven’t quite mastered). Use a spatula to fold half the omelette. Don’t worry if it’s messy, you can just call it a scramble instead 🙂 Either way, it’ll still taste just as good. Rinse and repeat for omlette #2. And enjoy! **Note: You’ll notice I don’t add any salt. The turkey bacon and Parmesan have enough that you shouldn’t add any more. But you can add a little pepper if you’d like. The best part about soup is that you always end up with leftovers. So, dinner? Done. Lunch tomorrow and the next day? Done and done. And you end up getting an extra 7 minutes of sleep in the morning because you don’t have to make a sandwich. 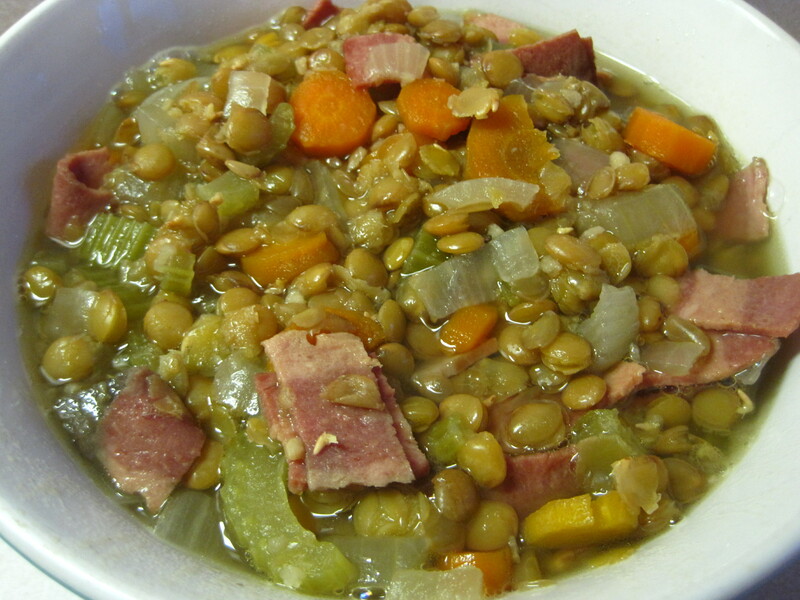 Oh, and did I mention that soup can be really yummy, easy, healthy, and inexpensive too? This recipe is a quintuple whammy! 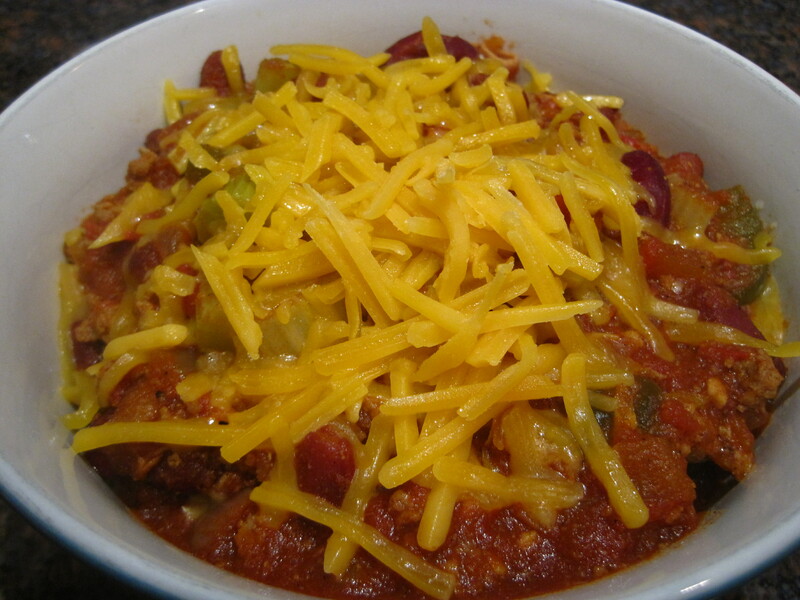 Yummy, easy, healthy, inexpensive, and makes leftovers? I'm in! Let’s start with yummy. 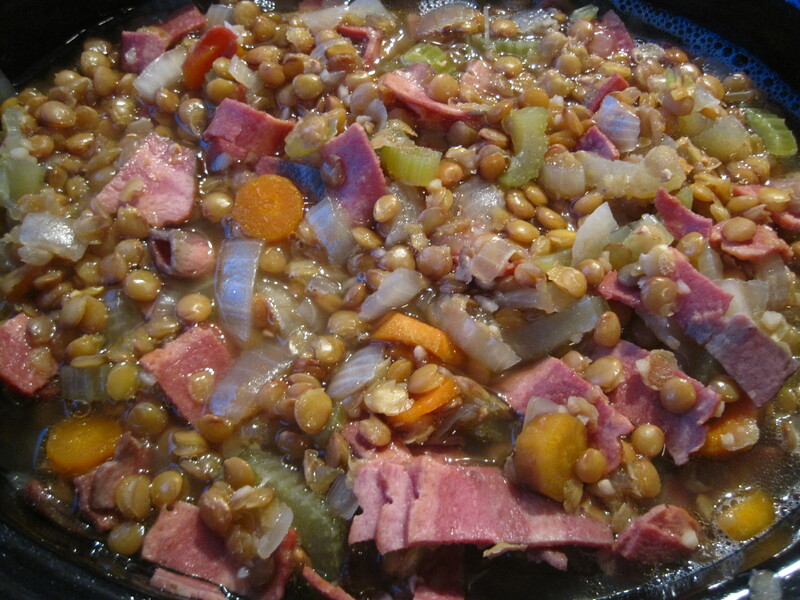 The turkey bacon is rich and smokey; the onions and garlic add a big kick of flavor; and the lentils, carrots, and celery make this super hearty. The smell that permeates the house when you cook this makes your mouth water, and you can’t help but eat cup after cup of this dish. Okay now easy. 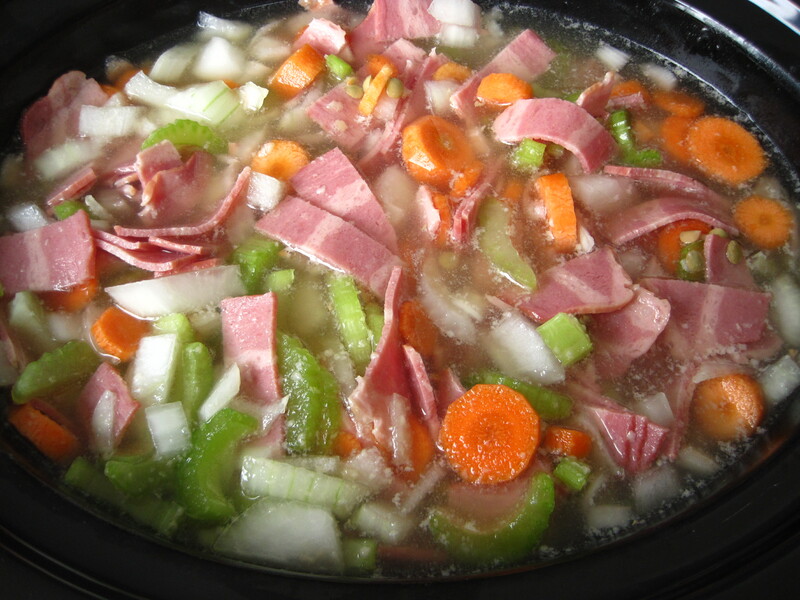 This one’s another crock pot wonder. So after the 15 minutes it takes to chop all your veggies and throw them into your crock pot, you just set it and forget it in the morning, go to work, and come home to an already cooked meal. This dish is as healthy as it is yummy. 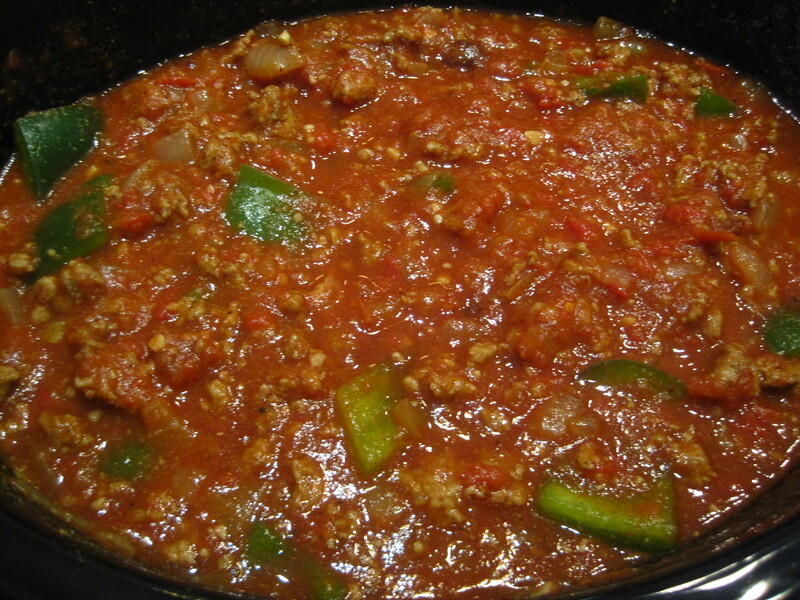 It makes about 6 servings, and it’s only about 194 calories per serving. But you’d never guess it. Guilt-free seconds, please! 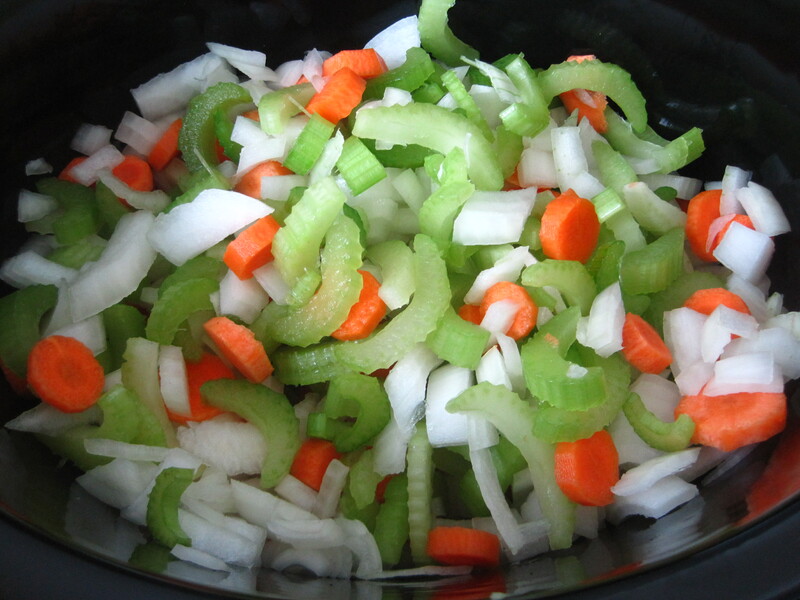 Chop your onion, carrots, and celery and throw them right into your crock pot. Keep your vegges about the same size so they all cook evenly. Add your garlic and lentils. Then slice your turkey bacon into bite-sized slices and add to the pot. Your turkey bacon should be about the same size as your veggies. Just slice across the whole package and then break apart with your fingers. Lastly, add your chicken broth and stir. Just stir and you're ready to go! Cook for 9-11 hours on low heat (or however long it takes you to get home from work). I made this on a cold, rainy Saturday and could barely stand it while I smelled it cooking all day. And you’re done! This dish is really delicious with sourdough bread (perhaps leftover from your pulled pork sandwiches! ).